Baptism is no mere “formality” in Christian life. 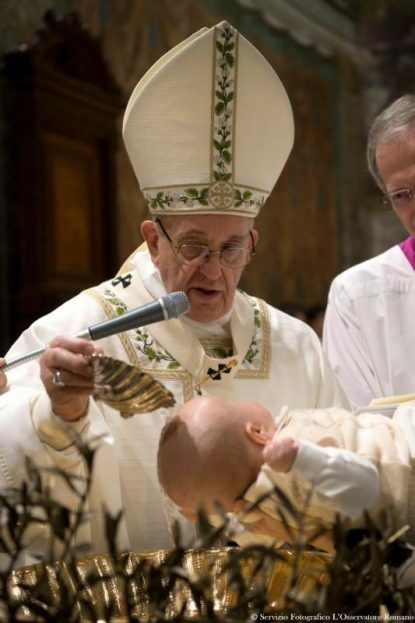 “It is an act that touches the depths of our existence,” Pope Francis remarked in January 2014, speaking four days before the feast of the Baptism of the Lord, when contemporary popes customarily baptize babies in the Vatican’s Sistine Chapel. I do not know all the reasons Pope Francis accented the word “formality” in telling what baptism is not. But obviously, to regard baptism as a formality, something like an academic society’s initiation ceremony, would be to misunderstand it entirely. The pope was concerned that some Christians may view baptism only as “a formal act of the church to give a name” to a child. More than that, he wanted to call attention to baptism’s far-reaching effects. Baptism, along with the sacraments of confirmation and the Eucharist, “configures us to the Lord and turns us into a living sign of his presence and of his love,” said the pope. The risk in viewing baptism as a formality is that it might also be considered unimportant. This is a genuine concern in times when reports of a decreasing number of infant baptisms often have been heard. The underlying causes of this decline undoubtedly are complex. Some new parents may harbor anger or disappointments related to the church. Many may be unaware of what others find rewarding about life in the Christian community. There are parents, too, who make no firm decision one way or the other about baptism after a child’s birth; no baptism takes place. Years later the question arises again, and for some the answer now is affirmative. Something like this happened for a participant in a parish class I lead to prepare parents for their child’s baptism. At one point this parent appeared about to apologize to me for delaying his child’s baptism so long. But I did not think he owed me an apology. Instead, I encouraged him to be happy about the decision now reached by his family and to look forward to a happy, heartfelt celebration of the fast-approaching baptismal day. Christians always considered baptism an event to celebrate. Yes, the weeks leading up to Easter, the principal occasion for baptisms during the church’s early centuries, were a time of penitence. We know these weeks as Lent. Baptism “grafts” believers “as a living member onto Christ and his church,” Pope Francis said. In the language of St. Paul, each baptized person becomes part of Christ’s body. Paul had much to say about Christ’s living body and its members’ diversity — their varied backgrounds, roots, talents and needs. But “we were all baptized into one body,” Paul said (1 Cor 12:12-29). Isn’t becoming grafted onto such a community reason enough to celebrate baptism? Baptized Christians celebrate the rewards of life in Christ’s living body. But they also are charged with doing their part to ensure that the faith community actually is “a gathering of friends” and “companions” for others who suffer and experience dark times. In the thinking of many, a formality refers to life’s red tape. It is inconsequential, something quickly to consign to the past. But baptism cannot be consigned to the past. That is why Pope Francis encourages Christians to discover and remember the date of their baptism. Otherwise, he fears, they could “lose awareness of what the Lord has done” in them and think of their baptism only as a past event.